Those of us of a certain age may remember the TV commercial where a breathless woman bathes in a tub full of bubbles and whispers…”Calgon, take me away.” It’s funny I can remember an old commercial but not where I put my glasses. 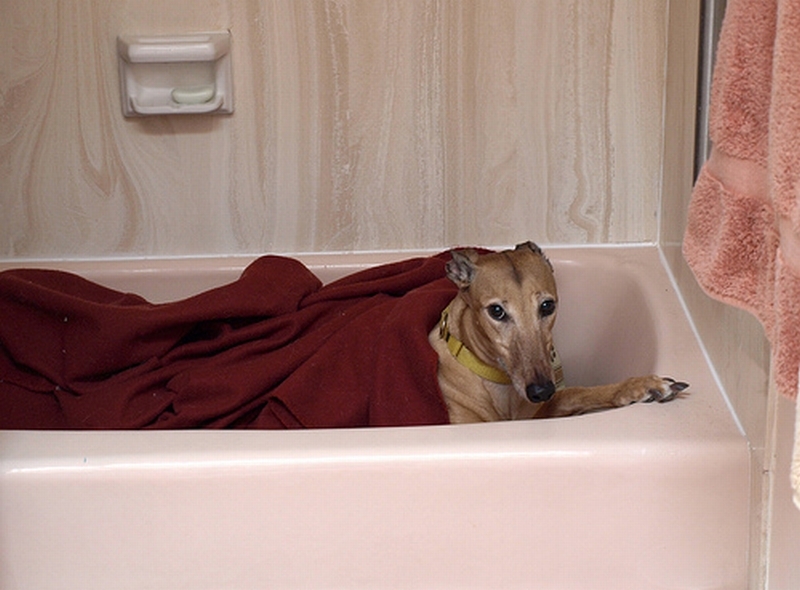 Dazzle the Greyhound likes to hang out in the tub (sans water). Thanks to Joe Romack for sharing this funny photo with us. LOL. I shot that photo over a year ago. Poor Dazzle is terrified of storms and we were in the heart of Monsoon season during her visit. She ate all treats & meals in the tub and it was quite hard to convince this sweet girl that it was o.k. to go outside to potty. Miss you Dazzle!